This is a story about what started this artist on her journey to painting the sea The story is written by Carol Thompson in the first person to share with you the excitement she feels when painting a seascape. 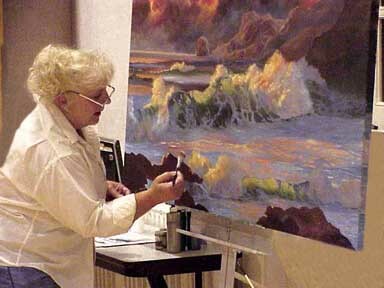 She is a dedicated artist, committed to excellence, while portraying the sea. The article is written in sections (pages) for ease of perusal and downloading. Photos of Carol convey her interest from the first time she saw the ocean to the present. She knows her subject and her medias, thus enabling her to capture the everchanging moods of the sea.